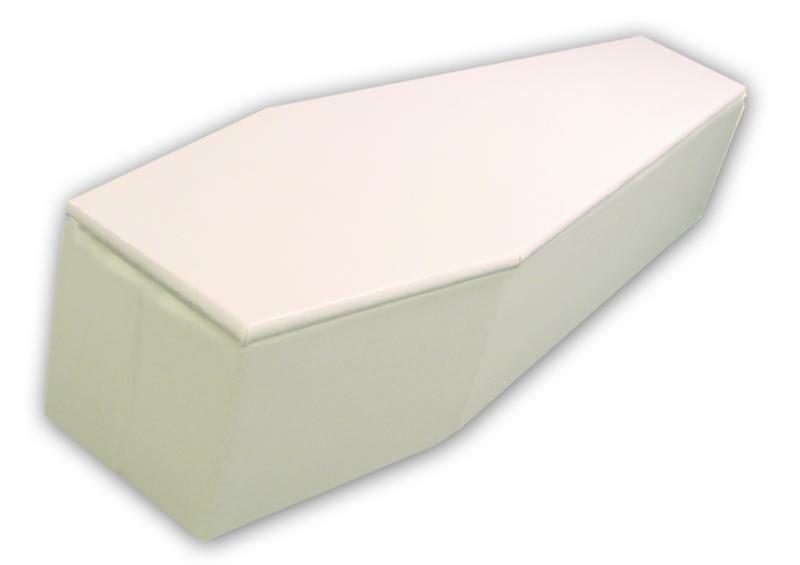 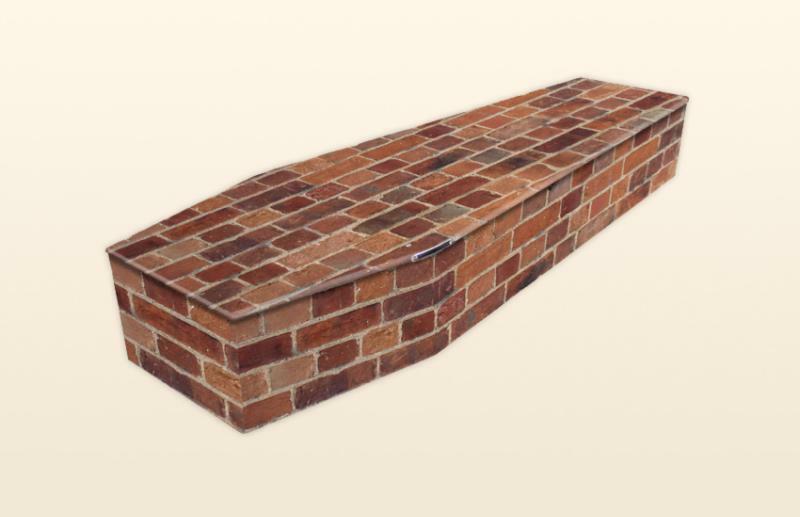 We have a comprehensive range of coffins available. 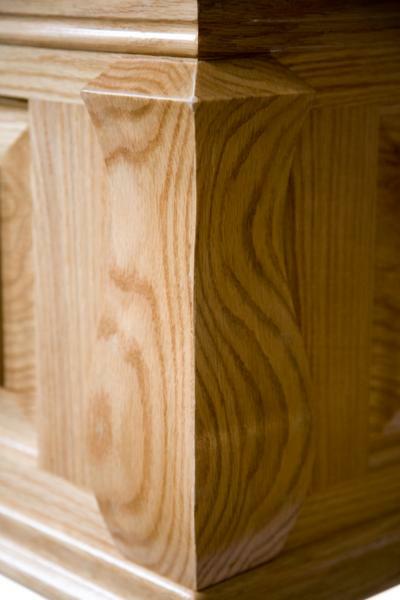 These products are sourced from within the UK, Europe and the USA to provide you with a wide selection of the best in quality, design and manufacture. 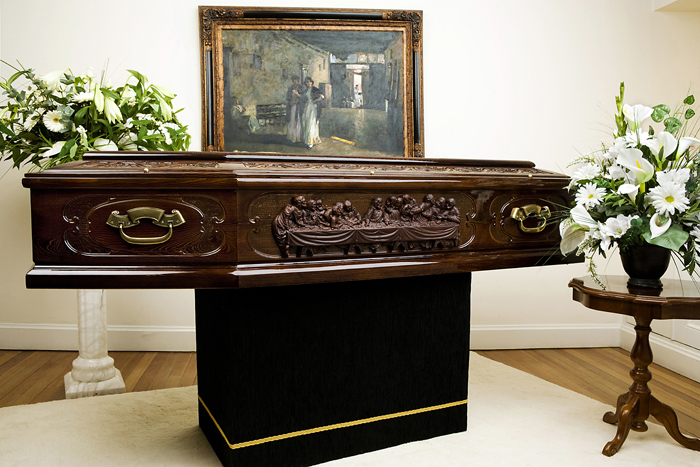 Further information about each coffin or casket is available by clicking on the thumbnail image. 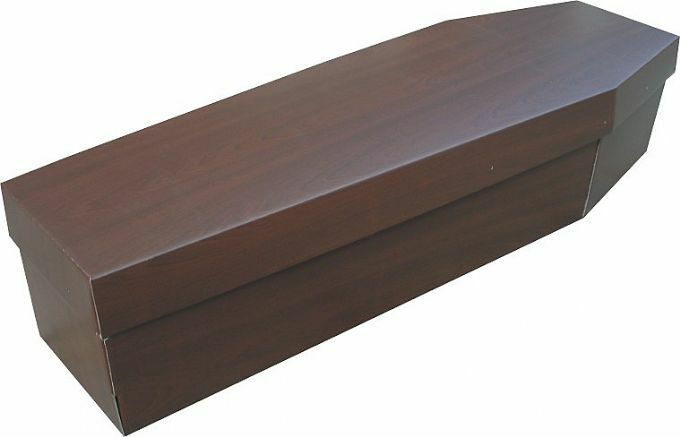 A very elegant and traditional natural light oak finished coffin with raised lid and imperial engraved panels. 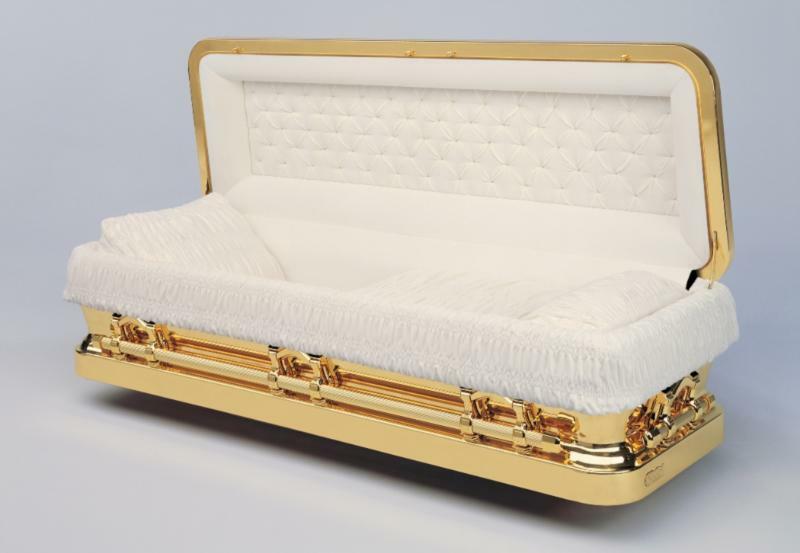 The coffin is furnished with gold fittings for both burial and cremation and lined throughout with a beautiful white satin lace bed interior. 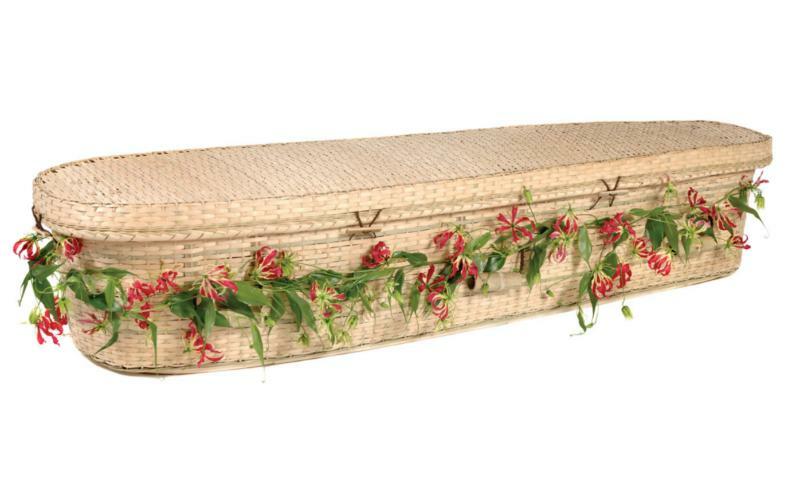 A very elegant and traditional natural mahogany finished coffin with raised lid and imperial engraved panels. 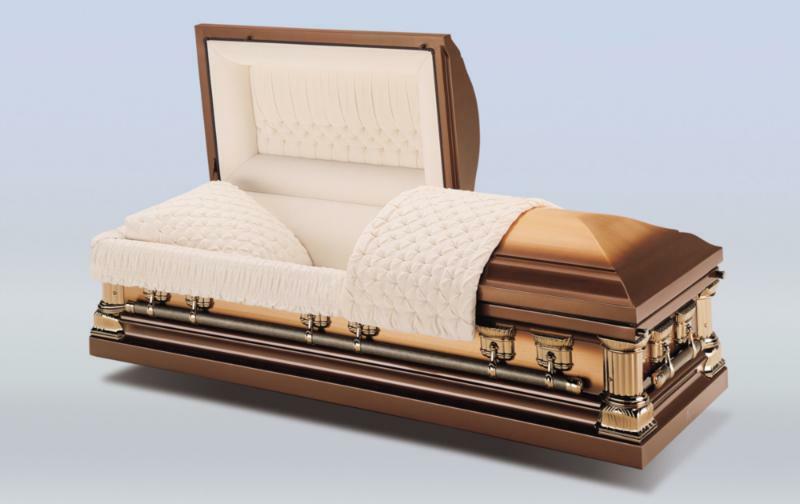 Furnished with gold fittings for both burial and cremation and lined throughout with a beautiful white satin lace bed interior. 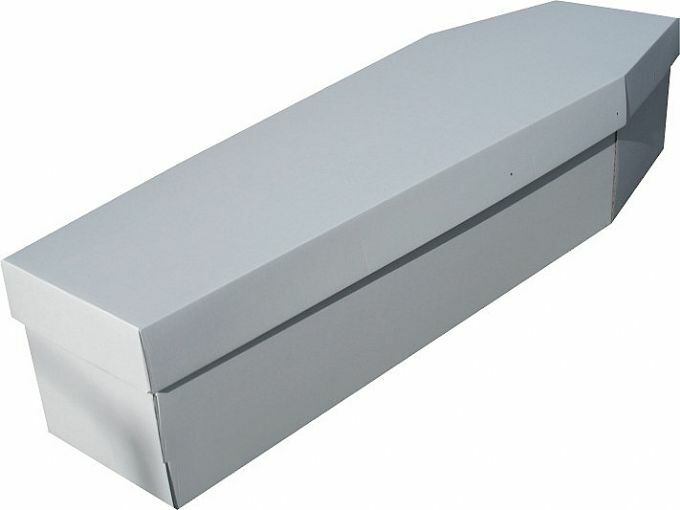 The ivory coffin is an elegantly finished white coffin with a raised lid and matching white wooden handles with silver fittings. 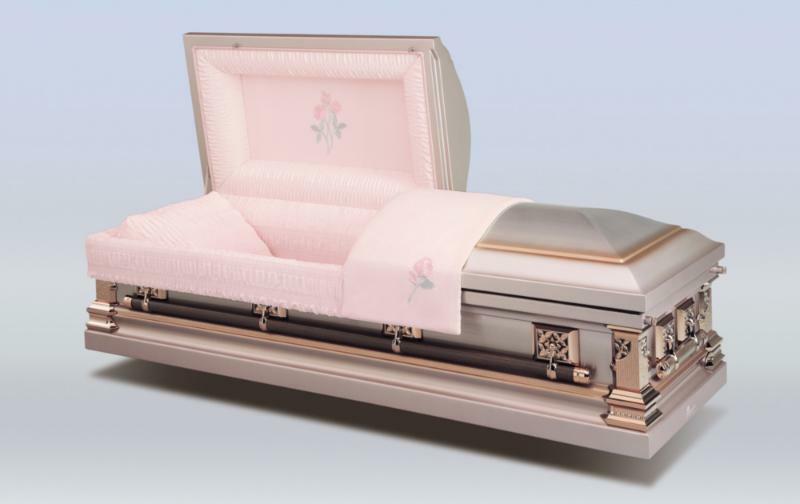 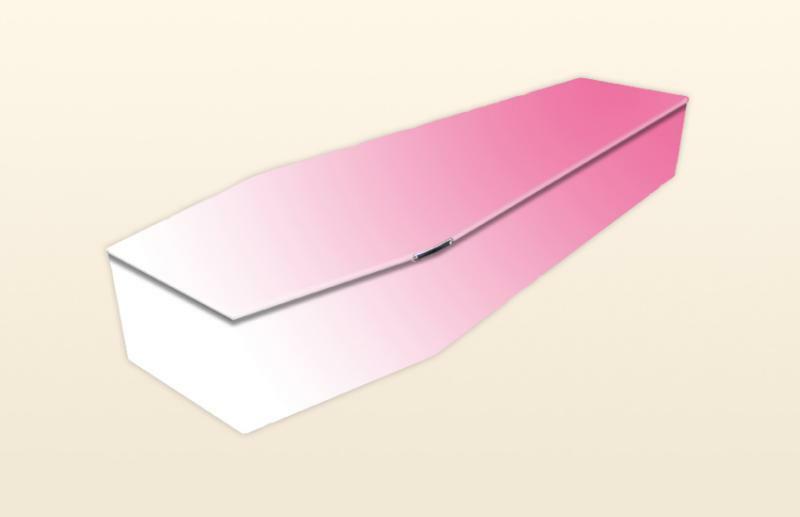 The coffin is furnished throughout with a beautiful satin interior bed which is available in white or pink. 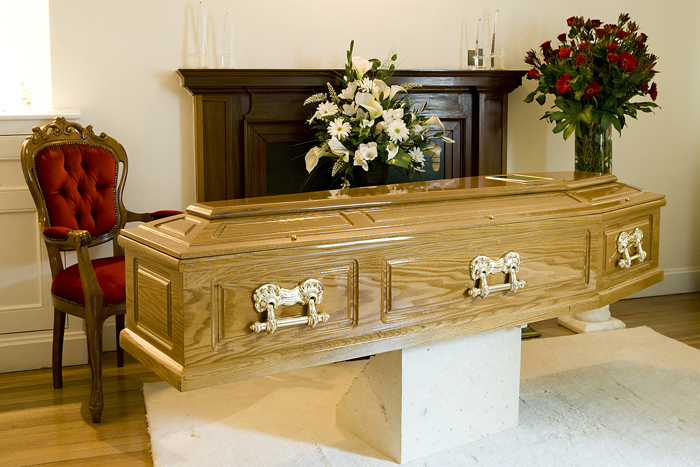 The Traditional Solid Oak coffin is made to the highest standards with a raised lid and panelled sides. 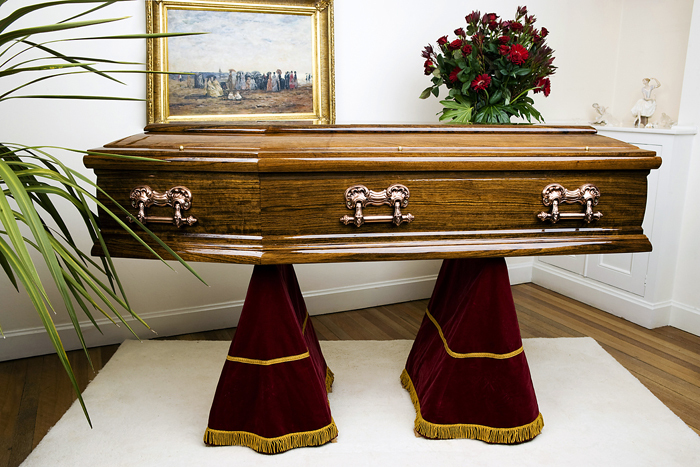 The coffin is fitted with traditional gold metal bar handles and ornaments. 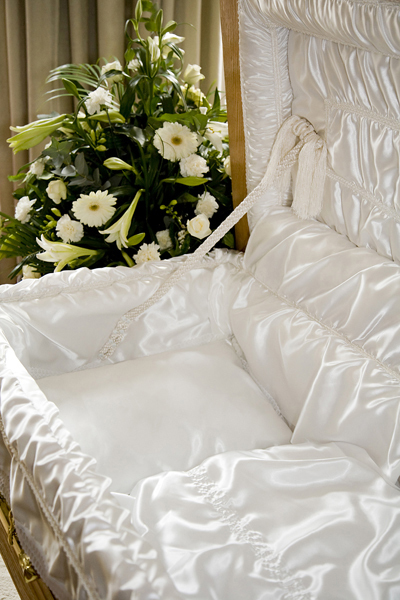 The coffin is furnished throughout with a quilted satin interior which is available in ivory, pink or blue. 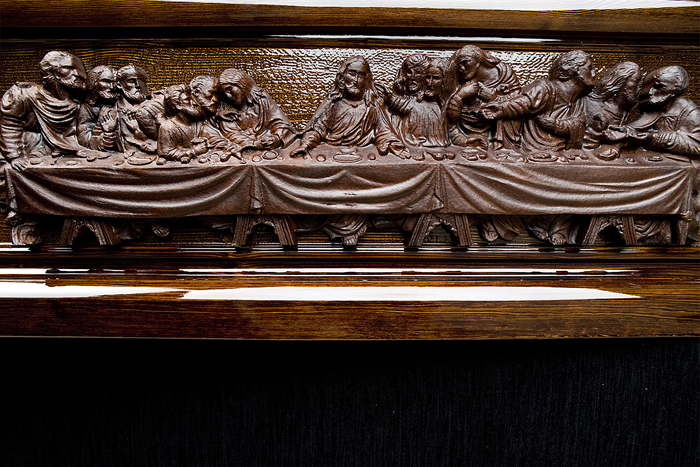 A 2” solid timber coffin, dark stained and finished to a high gloss lacquer with elaborately designed Last Supper panels fitted on each side of the coffin. 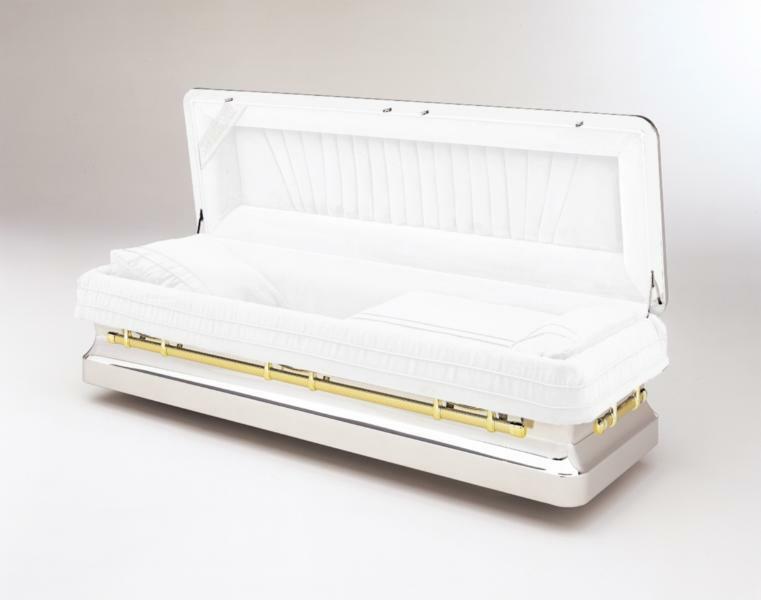 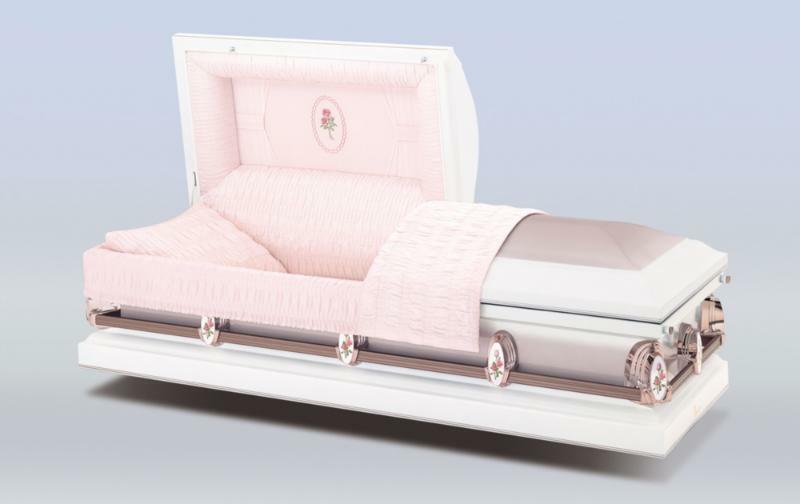 The coffin features quality metal handles and screws and is fitted with an Italian interior set in satin and lace which is available in white, blue, pink and champagne. 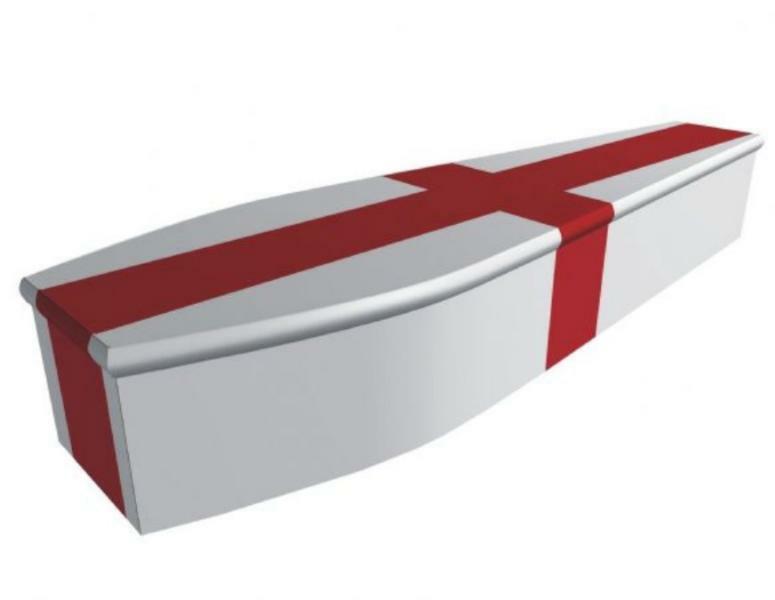 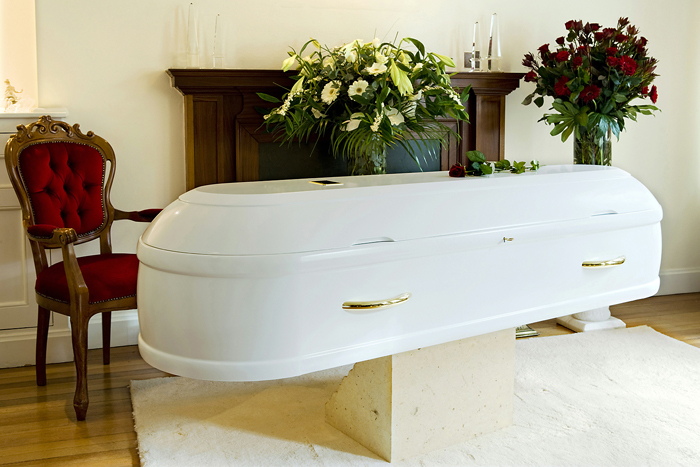 This coffin can be zinc lined for repatriation or burial in the UK. 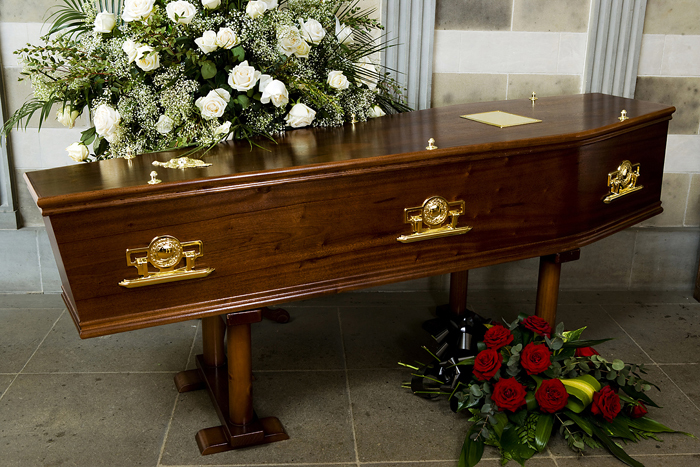 A 2” thick solid Italian oak coffin, highly polished to a piano finish and furnished with the highest quality brass handles and screws. 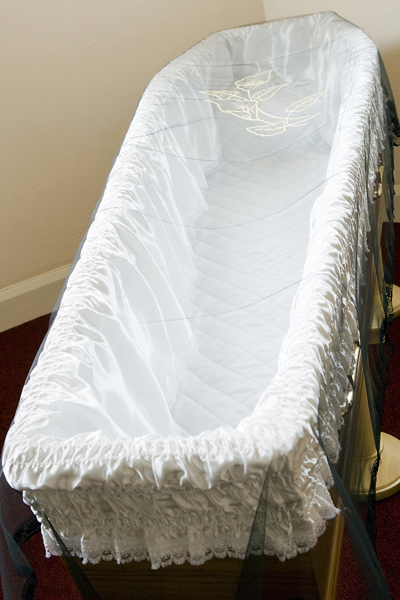 The coffin is fitted with an Italian interior set in satin and lace which is available in white, blue, pink and champagne. 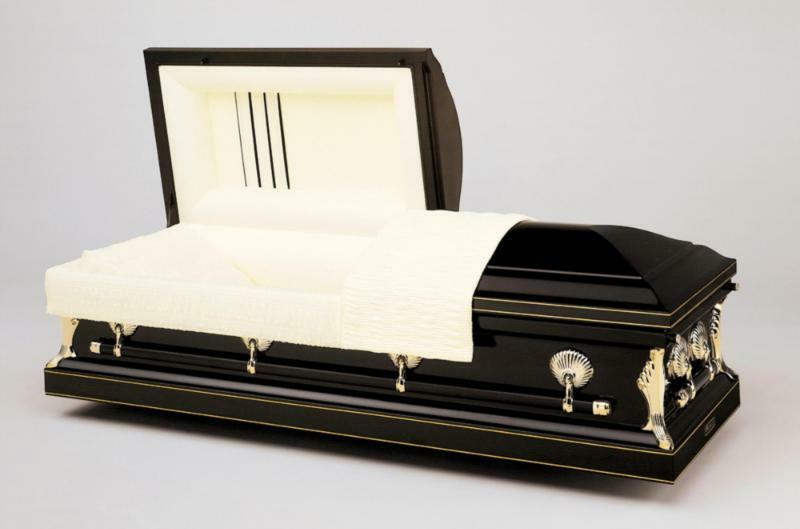 This coffin can be zinc lined for repatriation or burial in the UK. 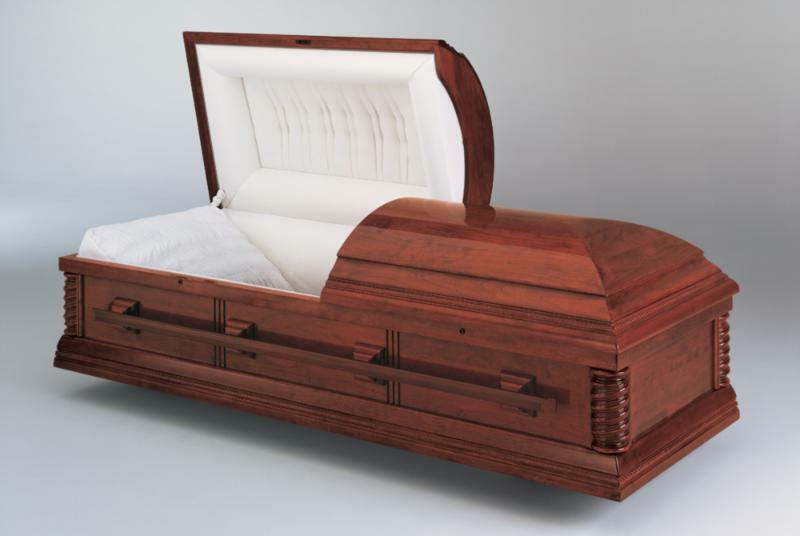 A solid Italian cherry coffin with raised high glossed piano wood finish lid and panels and matt finish mouldings. 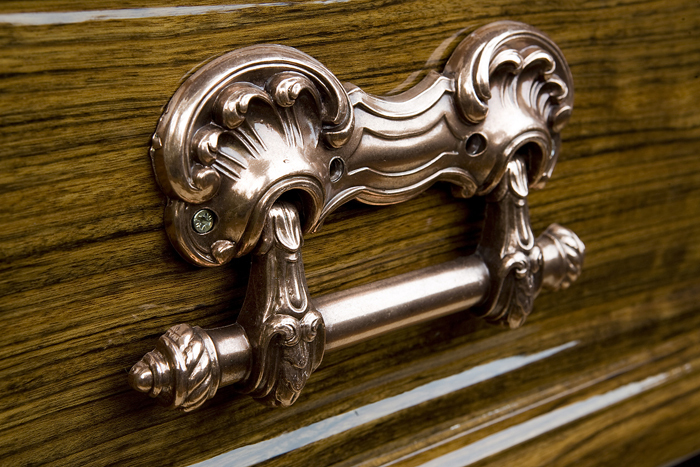 The coffin features elegantly engraved corner panels and is furnished with quality gold metal handles and screws. 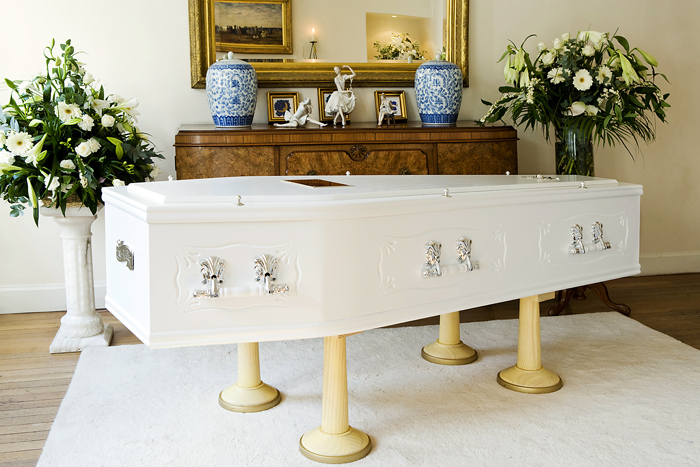 The coffin is fitted with an Italian interior set in satin and lace which is available in white, blue, pink and champagne. 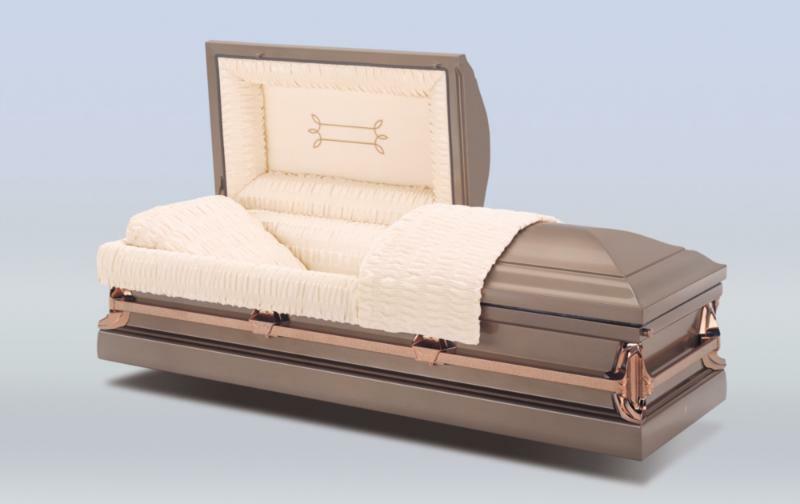 This coffin can be zinc lined for repatriation or burial in the UK. 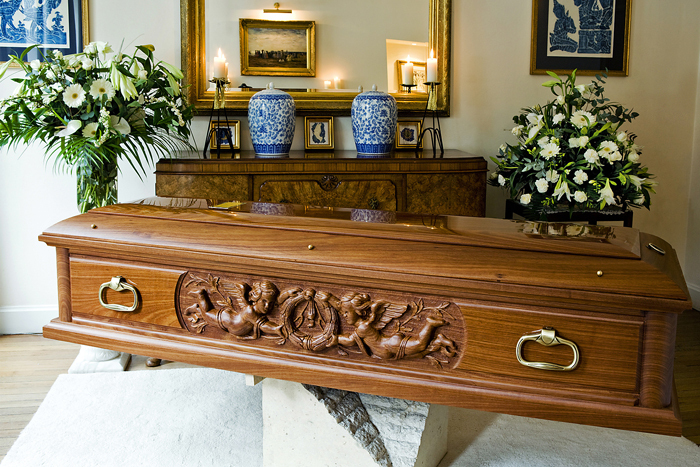 This solid Italian walnut coffin is polished to a high gloss piano finish and furnished with quality brass handles and screws. 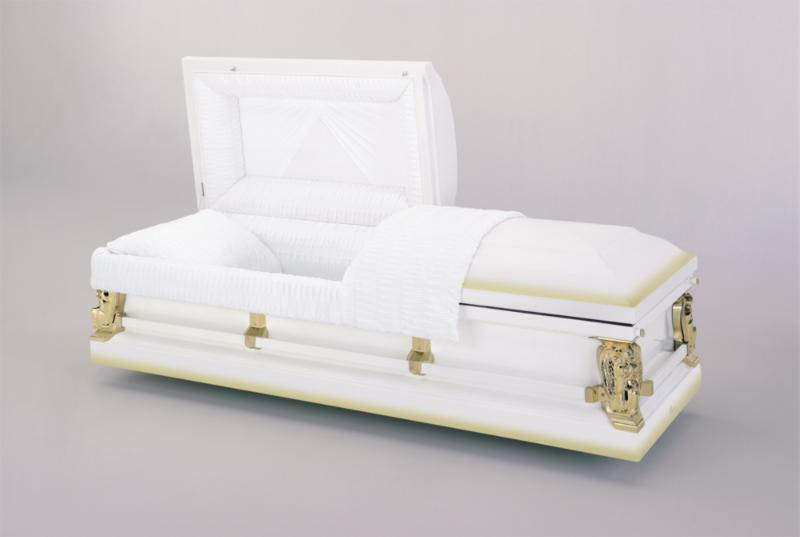 The coffin is fitted with an Italian interior set in satin and lace which is available in white, blue, pink and champagne. 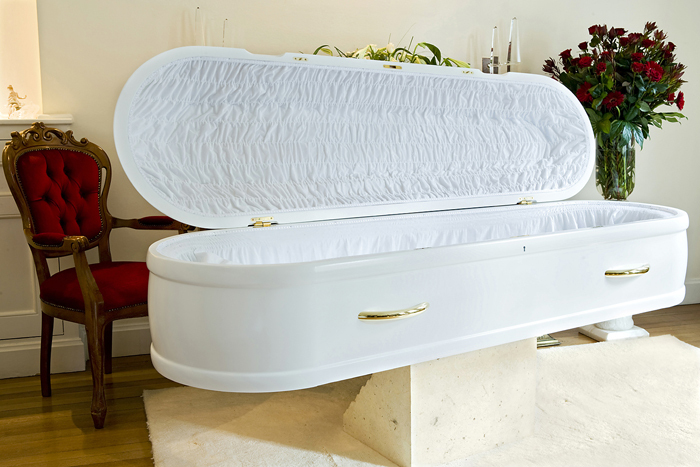 This coffin can be zinc lined for repatriation or burial in the UK. 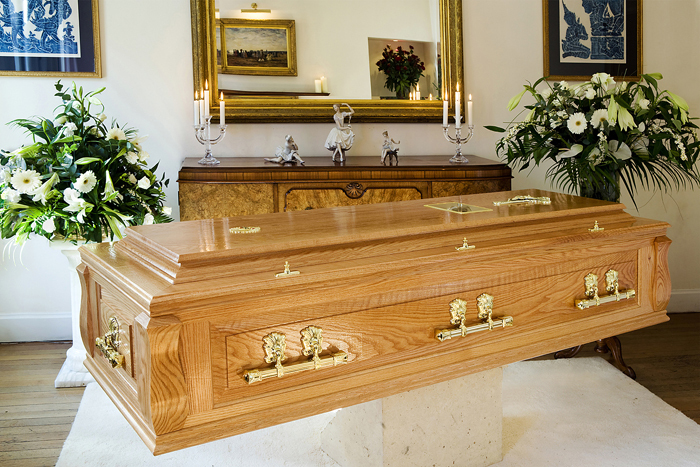 A solid oak casket made to the highest standards with raised lid, panelled sides and corner pillars. 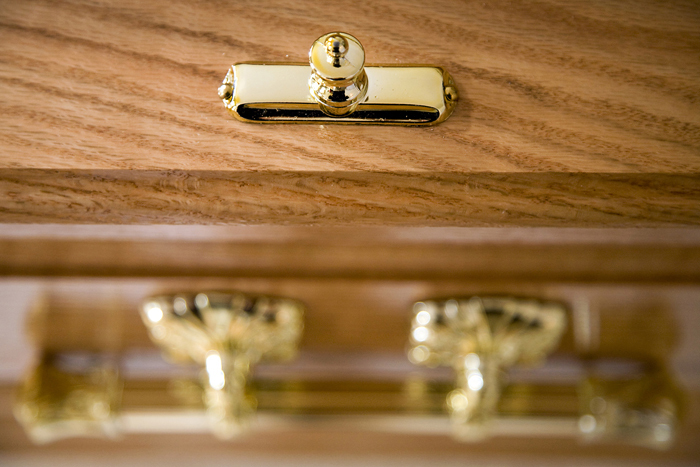 The casket has a hinged lid and traditional gold metal bar handles. 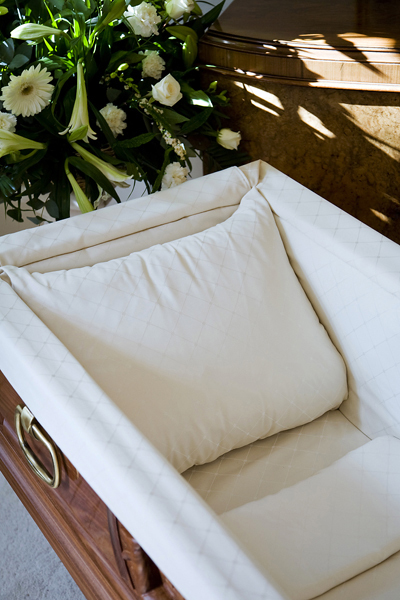 The casket is furnished throughout with a quality white satin casket interior suite. 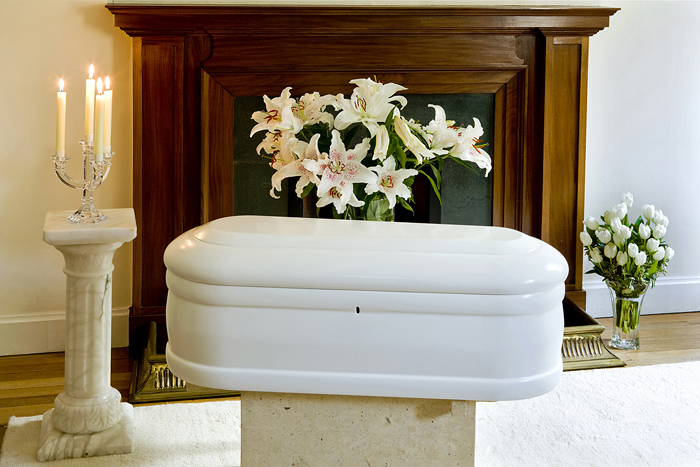 This beautiful white oval shaped casket is crafted to the highest standards in Spain. 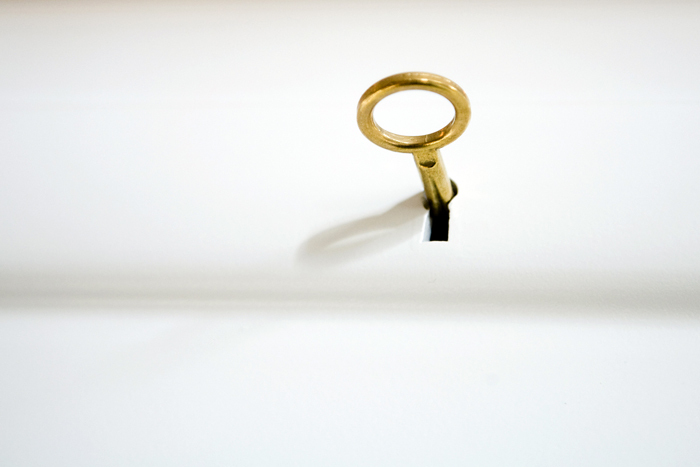 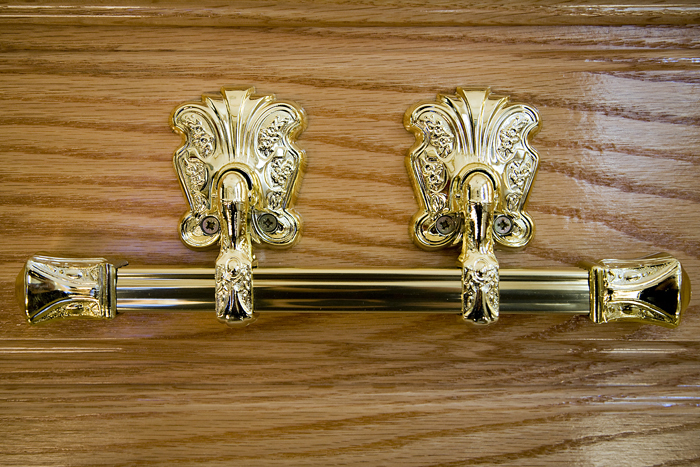 The casket features stylish brass coloured handles, matching name plate and a lock and key. 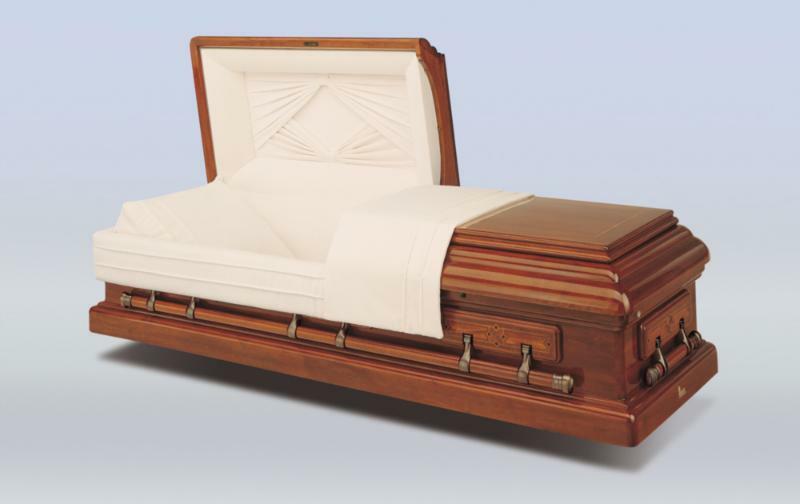 The casket is fitted with a satin bed and pillow. 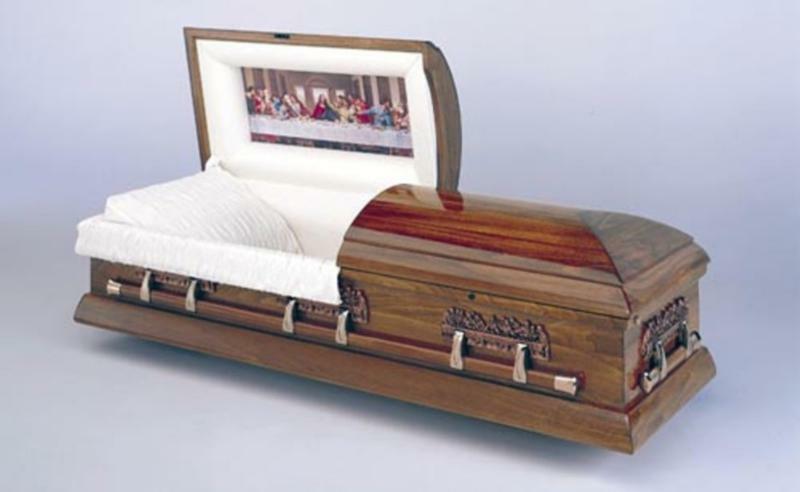 The Resmini Casket is craftsman made in Italy, and signed by the craftsman. 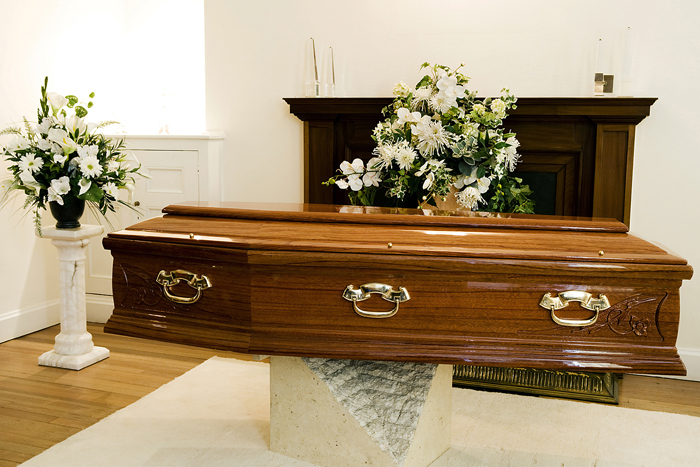 The casket is matt finished with a high gloss piano finish lid. 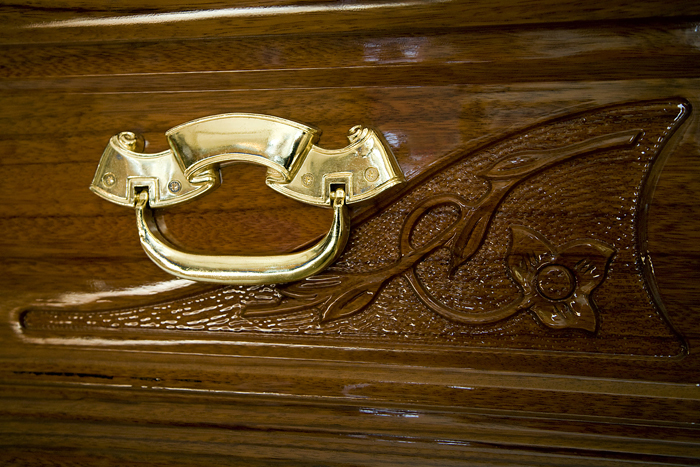 The casket features a carved panel and is fitted with quality Italian brass handles. 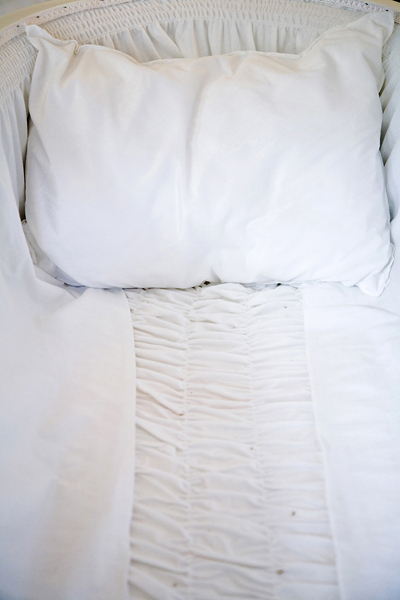 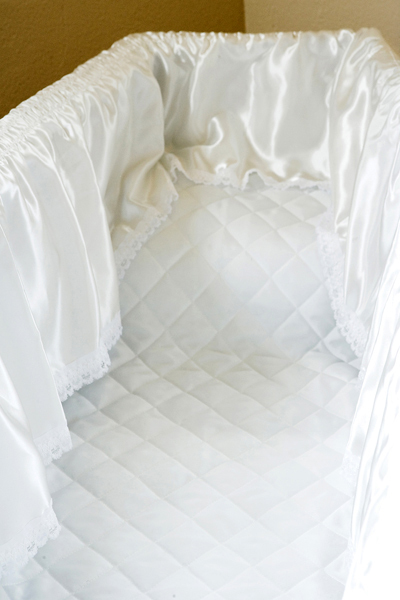 The interior is lined with a bed and pillow of white Italian satin. 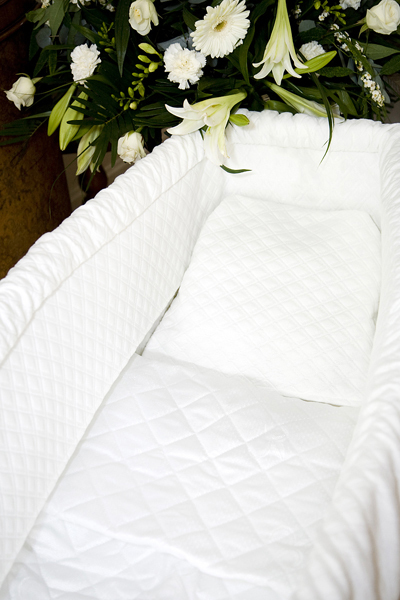 White finished child’s caskets and coffins available in foetus, stillborn and child sizes. 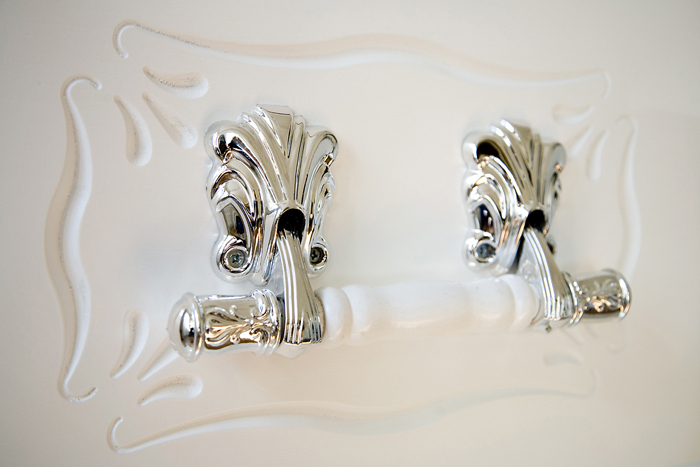 Furnished with silver handles and fittings and lined in white satin. 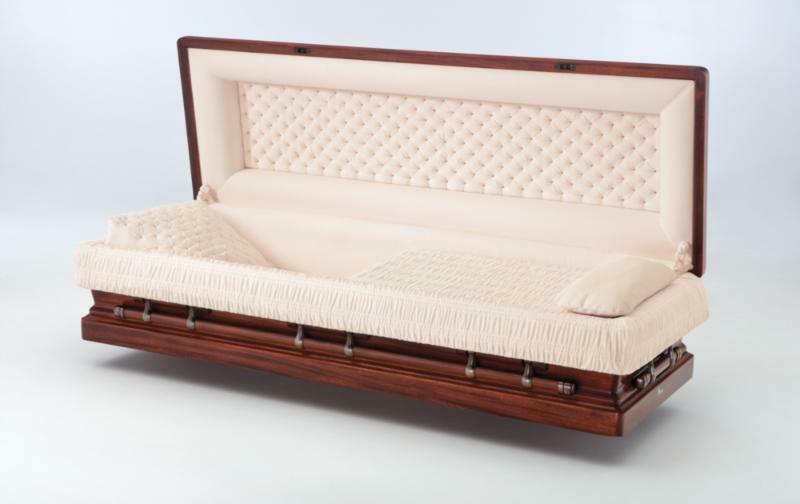 A rich rosewood finished coffin with a luxurious double moulding, furnished with gold fittings and neatly lined throughout with a bed interior which is available in white, pink or blue. 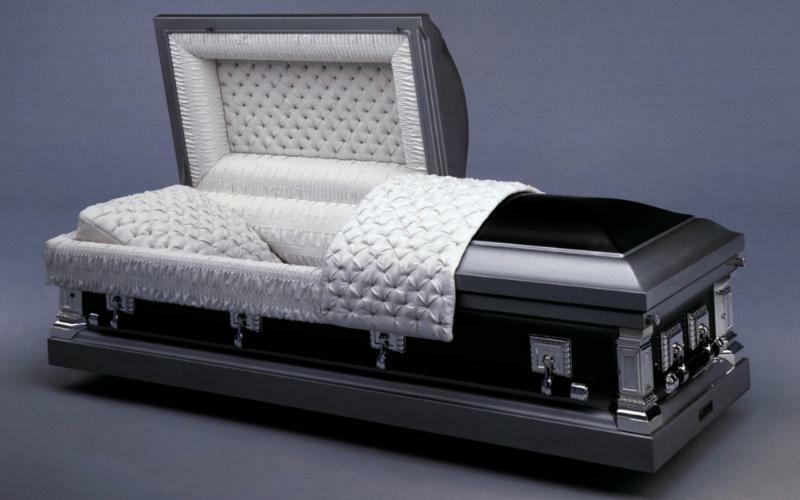 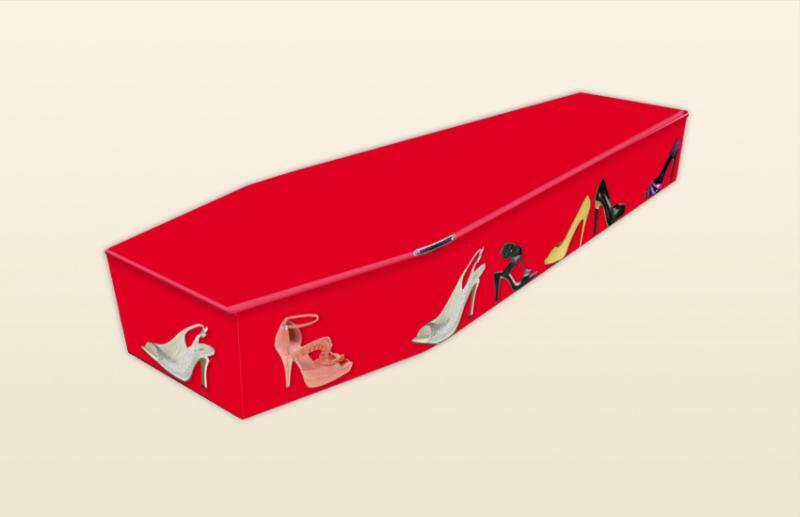 This coffin is perfect for both burial and cremation. 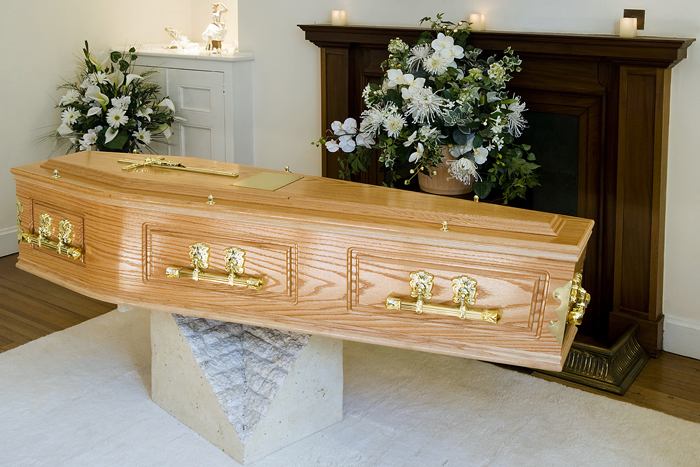 A light oak finished coffin furnished with silver fittings and neatly lined throughout with a bed interior which is available in white, pink or blue. 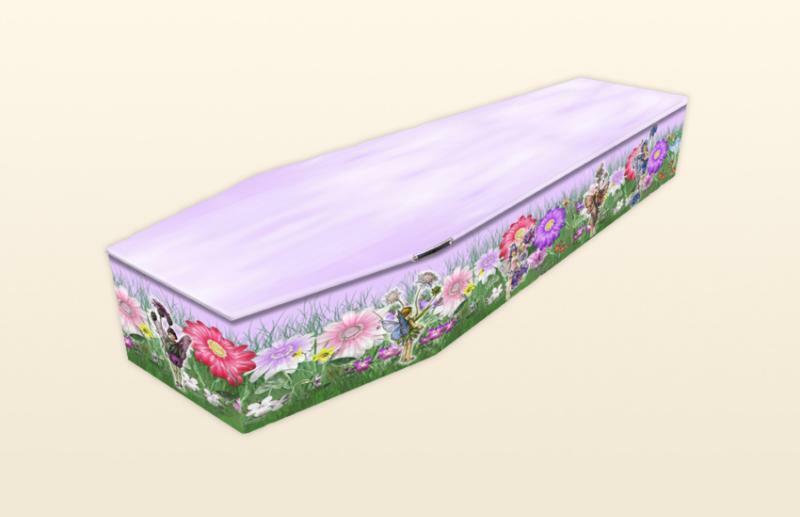 All coffins can be personalised and are available in traditional wood, 100% recycled cardboard, or as an American style casket. 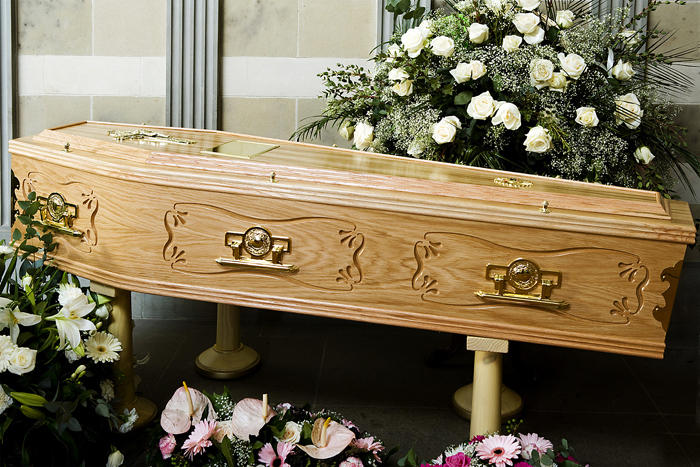 The ability to personalise the design enables families and friends to celebrate the life of their loved one in a unique and special way. 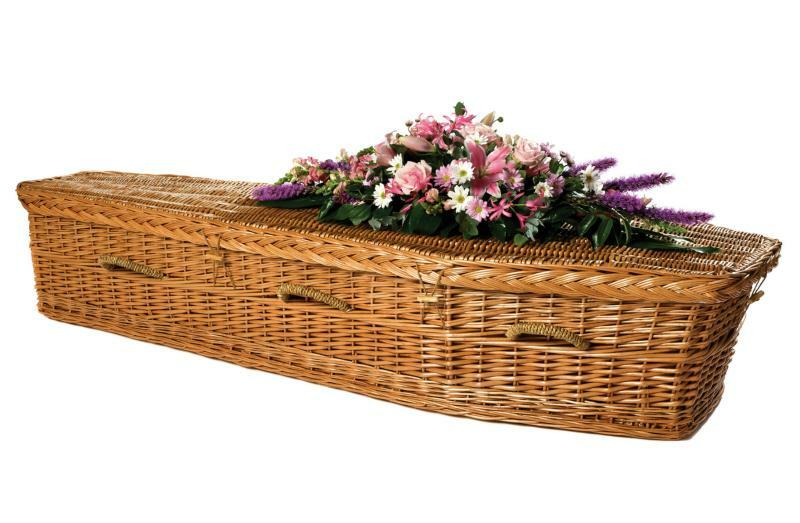 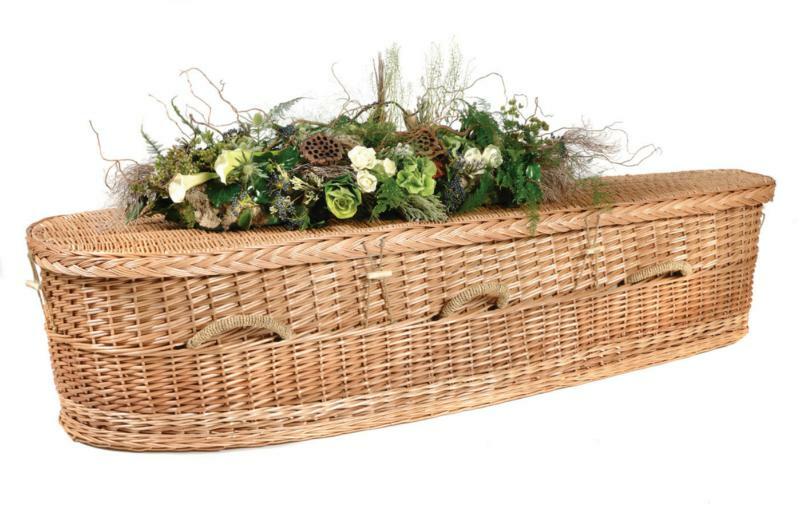 The Willow and Bamboo coffins are hand woven from natural materials and built with a gently curved shape in keeping with the beauty of the material used. 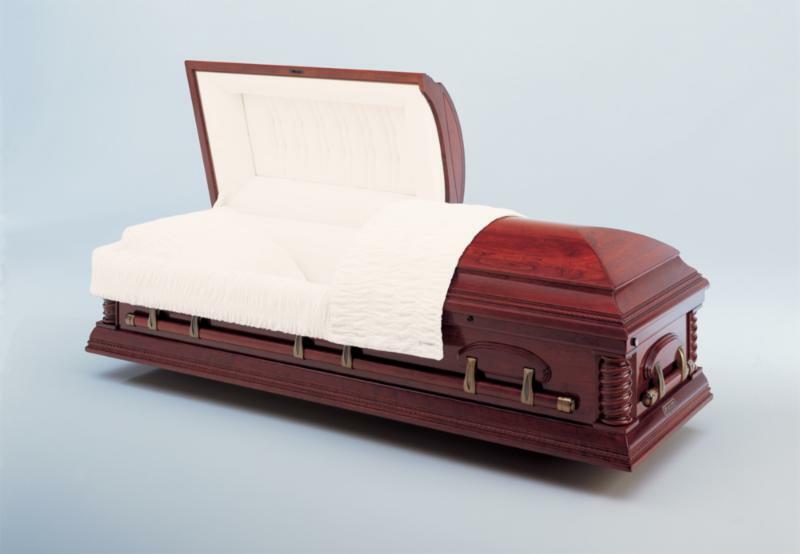 The coffins are robust, secure and equally suitable for burial or cremation. 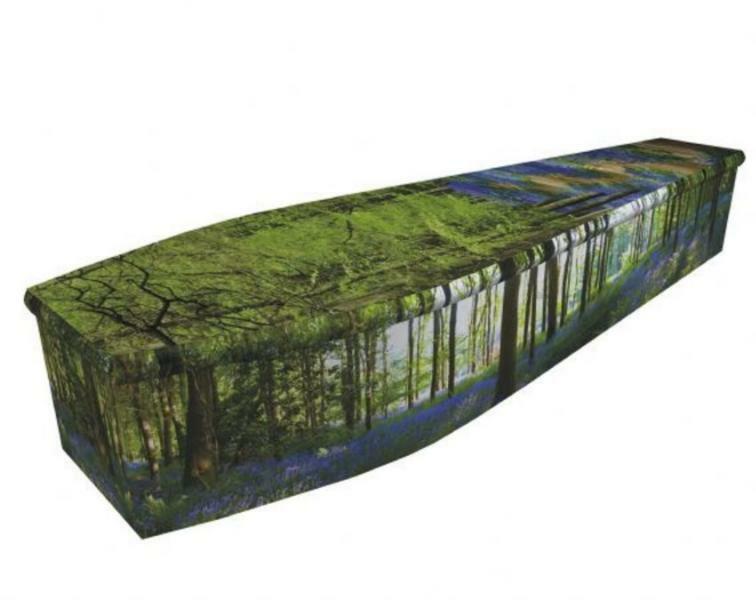 All coffins are 100% biodegradable. 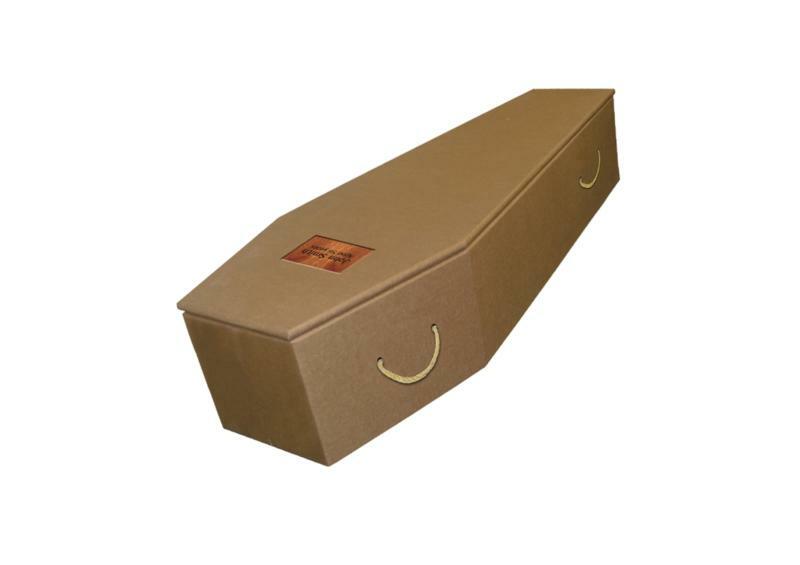 The cardboard coffins are made from biodegradable cardboard. 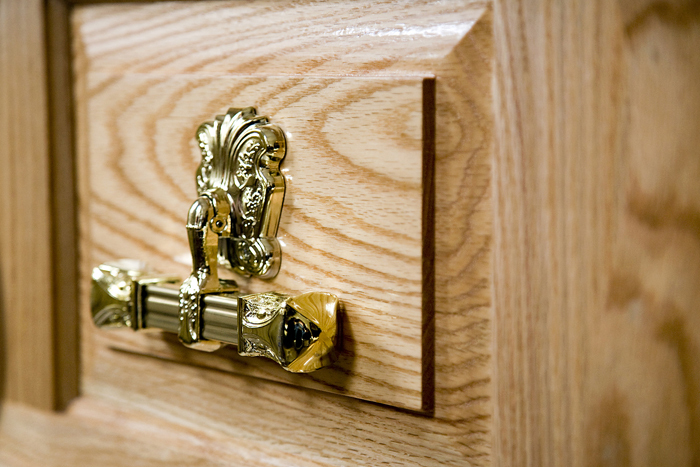 In addition to the standard product range any bespoke design is available. 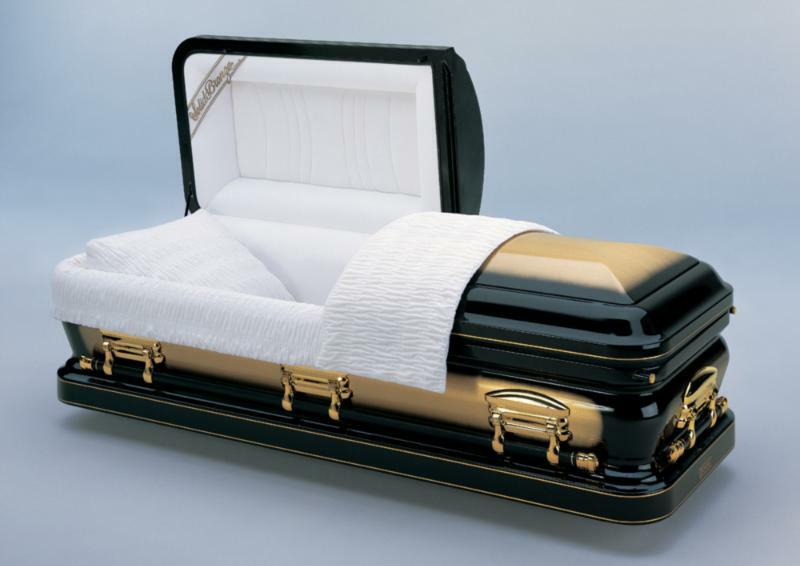 The coffins are non toxic and are equally suitable for burial or cremation. 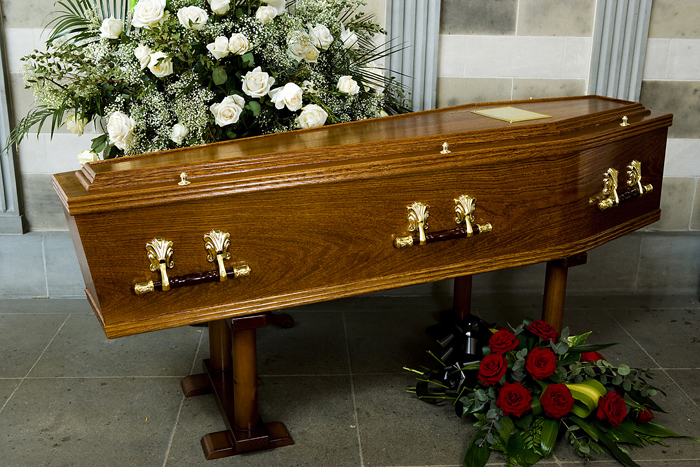 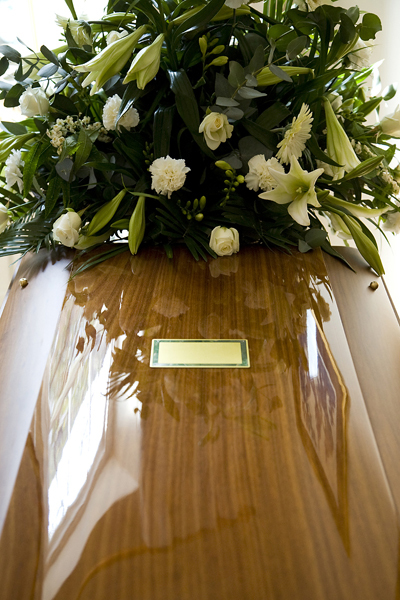 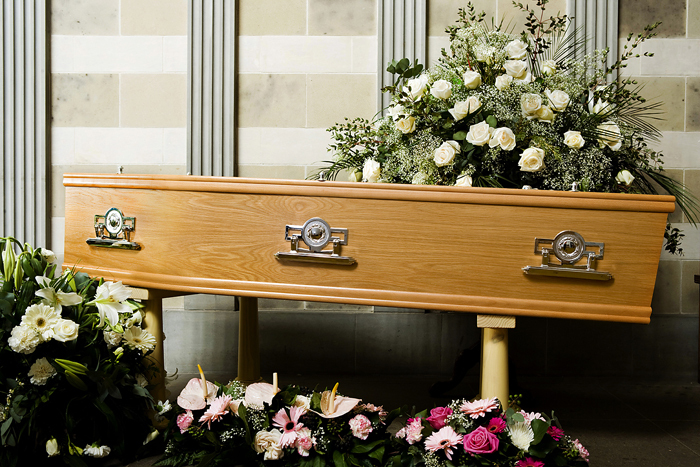 Metal caskets are available in bronze, copper or steel. 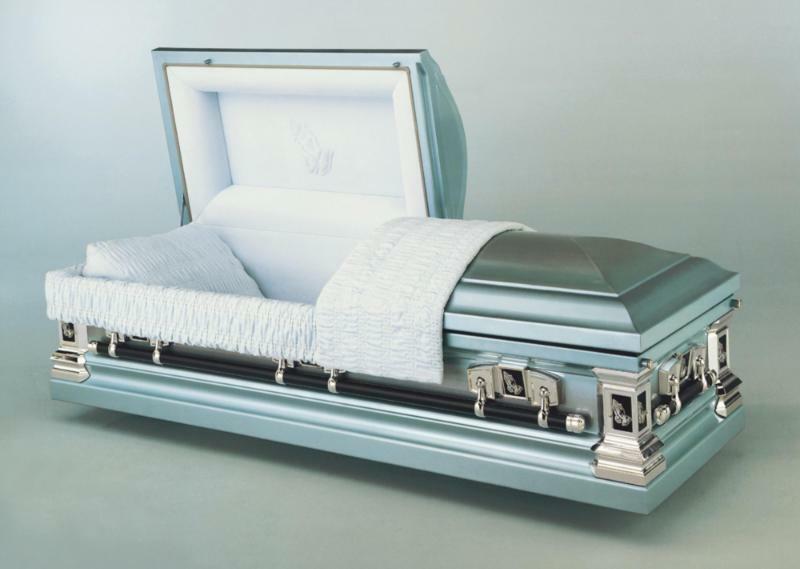 All metal caskets are hermetically sealed to ensure that they are both air and water tight. 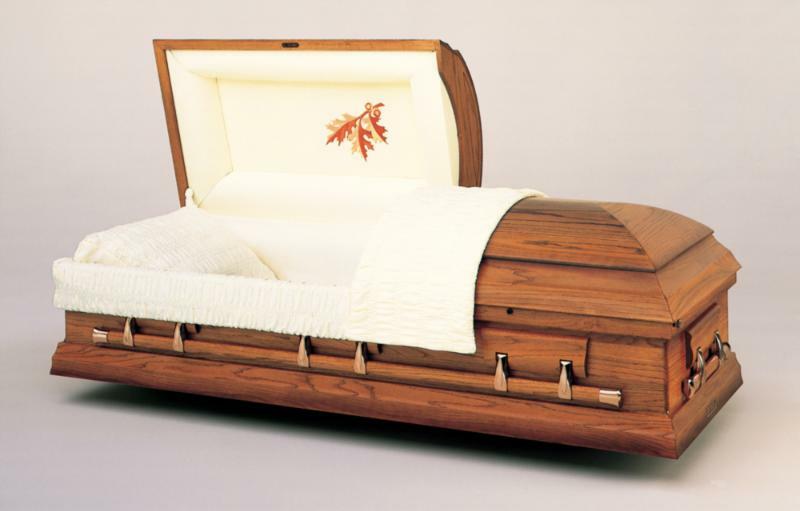 All caskets are made from finest grade hardwoods. 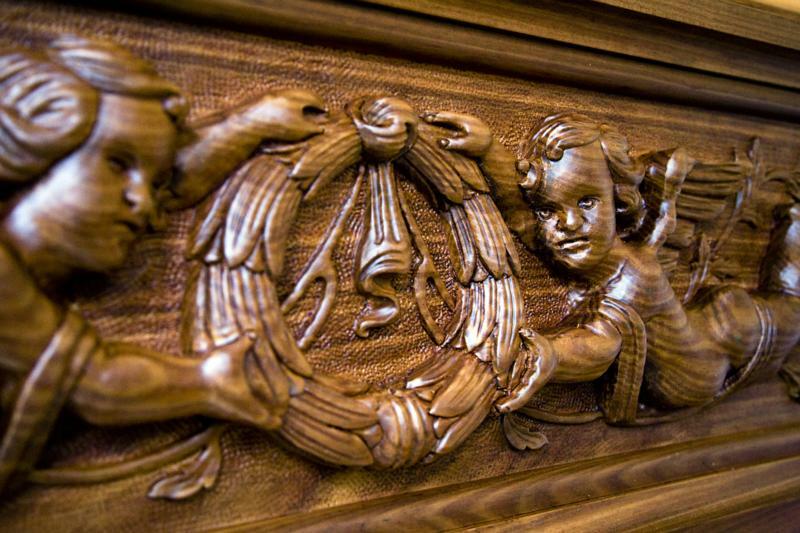 The caskets are buffed and polished to enhance the natural grain of the wood resulting in a silk smooth finish. 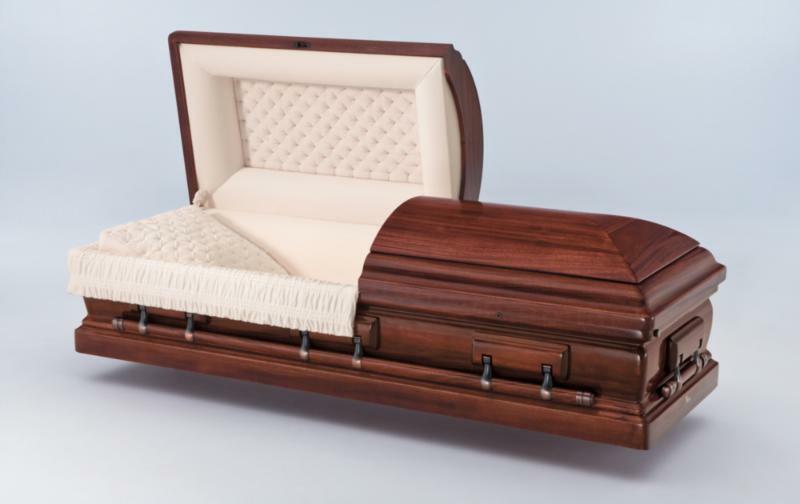 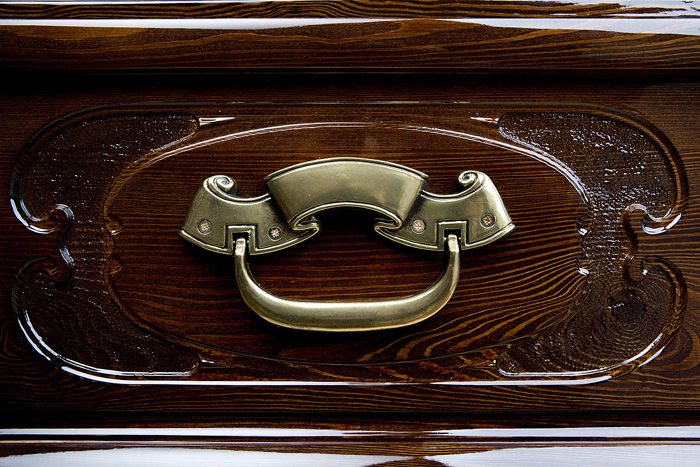 Our range of caskets have a fine furniture satin or high gloss finish and are made with premium antique hardware fittings. 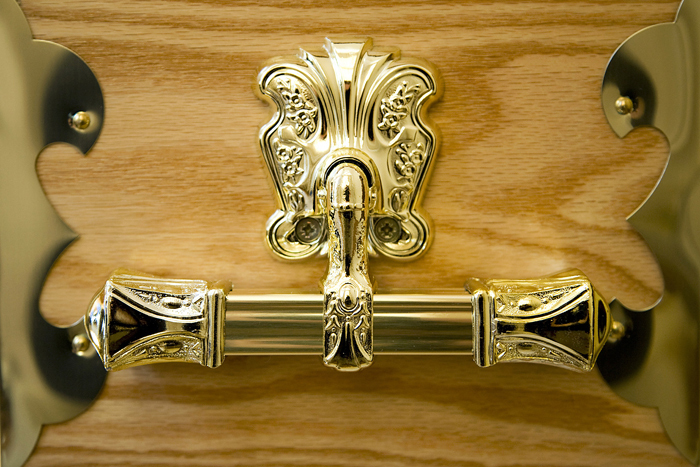 The Millennium is made from chrome and nickel stainless steel. 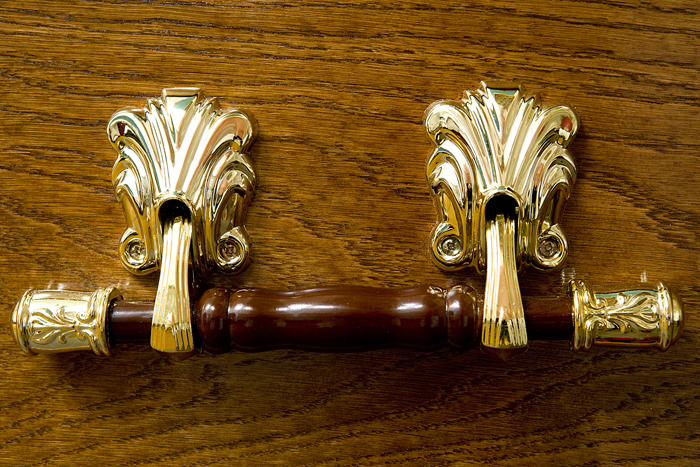 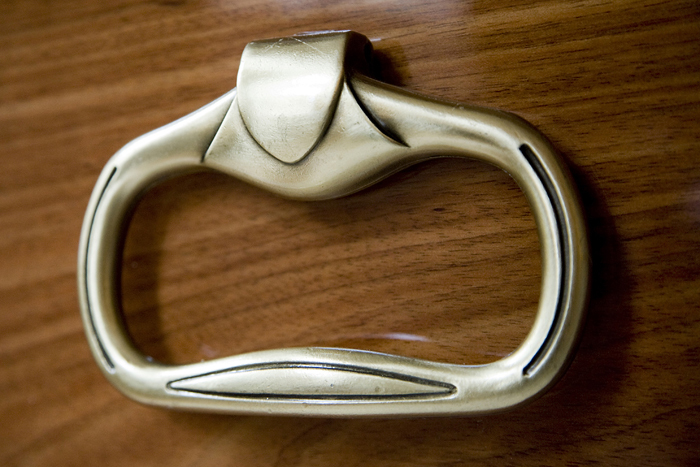 The Promethean is made from bronze and includes 14 carat gold plated hardware. 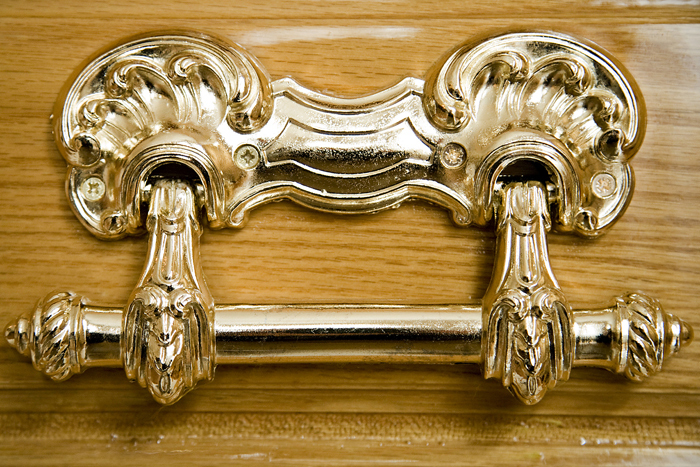 The Montrachet is made from traditional mahogany and is hand polished to a high gloss finish. 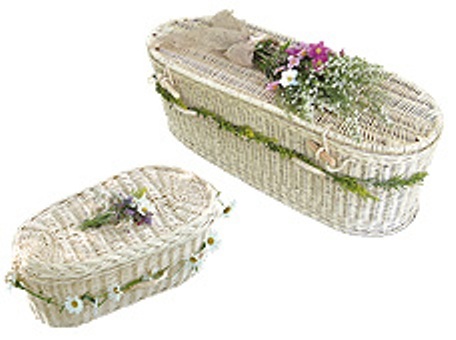 We have a comprehensive range of cremation urns available. 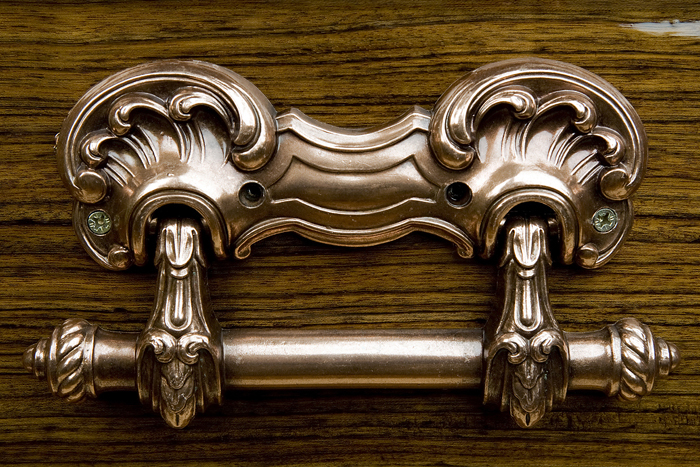 These products are sourced from within the UK and Europe to provide you with a wide selection of the best in quality, design and manufacture. 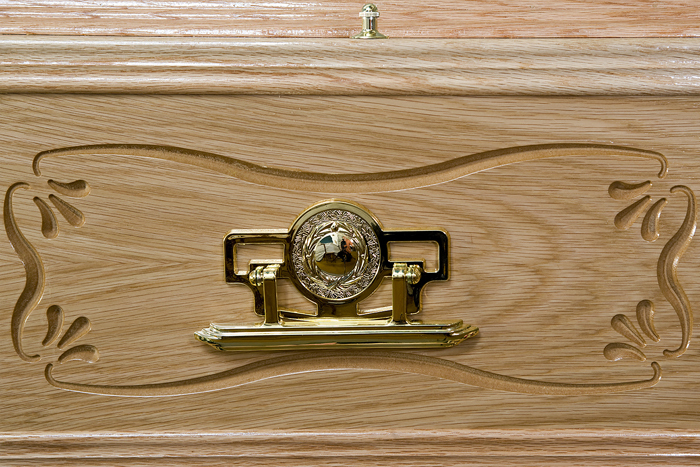 Further information about our range of urns is available from our funeral arrangers. 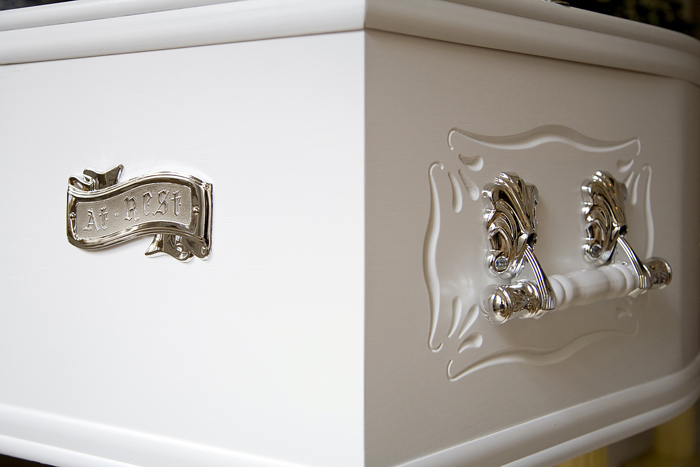 Urns can be personalised. 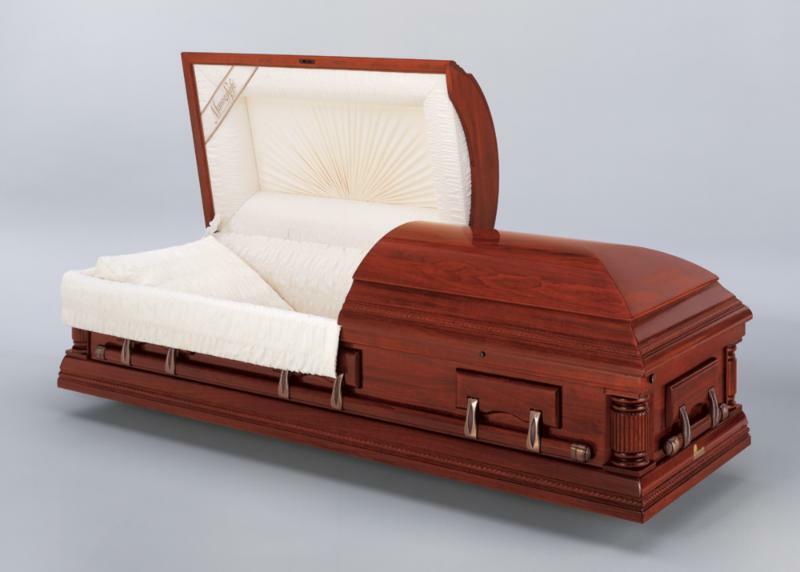 The ability to personalise the design enables families and friends to celebrate the life of their loved one in a unique and special way. 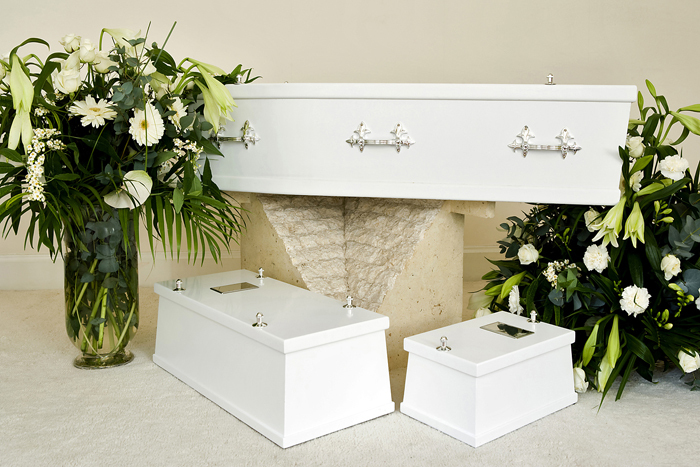 Our large Urn range includes Brass, Ceramic, Crystal, Fibreglass, Bio, Wooden, Marble and Ash.